One month after the world-renowned bird observatory was destroyed, how is the close-knit community coping? It has been just over a month since the Fair Isle Bird Observatory and guest house was destroyed in a blazing fire, and the sight of the amber flames is still sifting through the mind of one of its former administrators, Hollie Shaw. It would be hard not to stew over the images, sights and sounds. Four weeks on and if you stand next to the near-apocalyptic remnants of the fire, the charred smell of burnt wood, metal and just about everything else still combs through the nostrils. The fire appliance which has been left down the hill from the observatory. 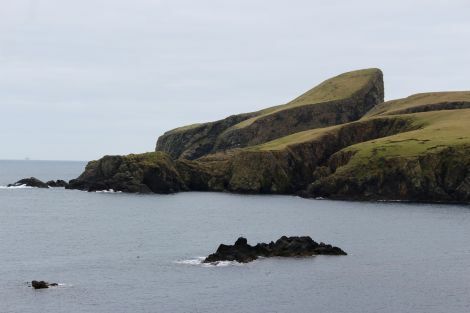 The island community of about 60 people, bobbing in the sea between Shetland and Orkney, is hugely thankful that no injuries were sustained in the fire at the building, which was opened in 2010 at a cost of around £4 million to replace the old observatory. Warden David Parnaby and wife Susannah, who is the administrator, lived with their two children in an adjoining flat, which also burnt down. They are the latest in a long history of people at the helm of the observatory, which was founded in the 1940s. The local fire engine tasked to attend to the blaze still sits a stone’s throw away, looking somewhat despondent downhill of the observatory ruins, after developing a fault during the operation. It can’t get back up the hill until it is fixed, but thankfully a new vehicle was recently shipped into the island. 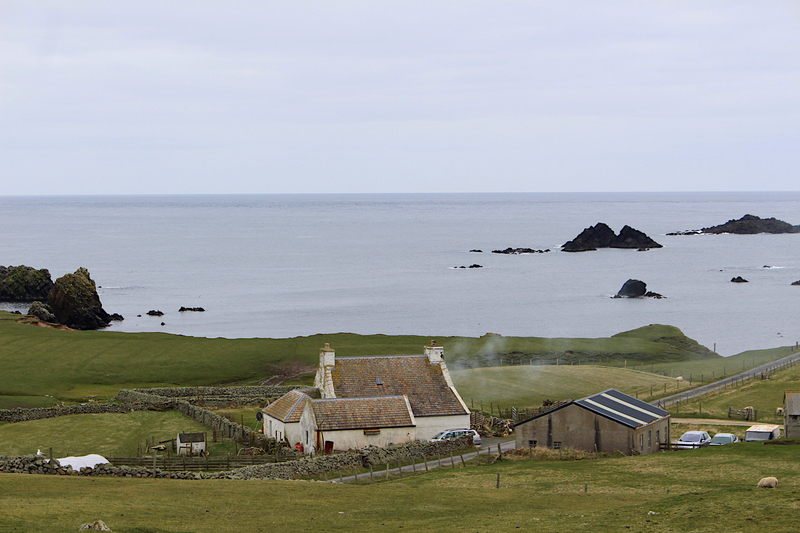 Susannah, one month on, is slowly rebuilding her life with her family, moving furniture in their new temporary home on the island, some eight years after first moving to Fair Isle. “It felt very unreal for most of the day,” she says as she recalls watching the fire unfold. “I was very mindful that people that you’re very close to are dealing with the fire, and you’re more concerned about people than you are about anything else. David and Susannah, as well as a couple of assistant staff, will continue the ornithological studies on the island this year to add to an unbroken record of data spanning decades which was digitised before the fire. Hollie and her husband Deryk ran the observatory for 12 years from 1999, moving up from Kent despite having never been further north than Edinburgh, and they ended up doing one season in the new building before “retiring” from ornithology and staying on the island. Former bird observatory administrator Hollie Shaw. Deryk, who works on Fair Isle based ferry Good Shepherd, was one of the local retained firefighters who bravely tackled the blaze. 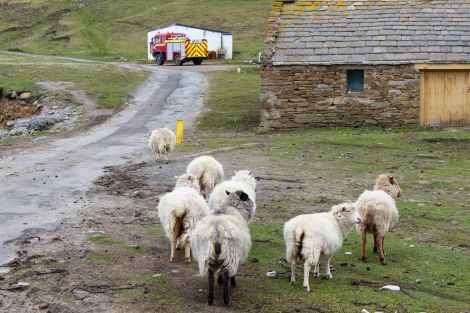 “He was saying that on the night of the fire, when it was all over and there was no way the last of it was going to be saved, he just sat on the hillside watching the last of it burning,” Hollie says, remarkably switched on despite having been up since around 2am for lambing on their croft. 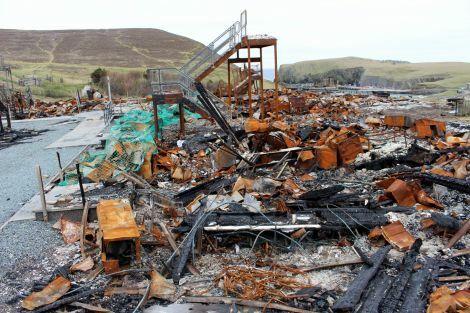 While the directors of the bird observatory trust want to see the building re-constructed as soon as possible thanks to insurance money, there is no doubt that Fair Isle will be hit hard. 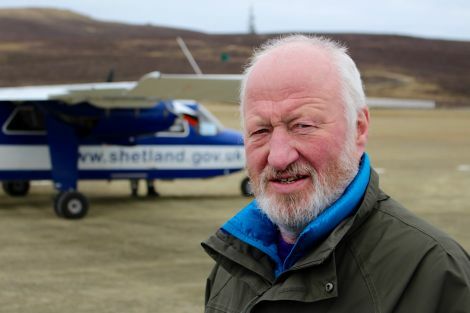 A number of flight bookings from Tingwall Airport, always busy in the summer with birdwatchers, have been cancelled, and the local shop – which supplied the observatory with food and drink – will take a hit. 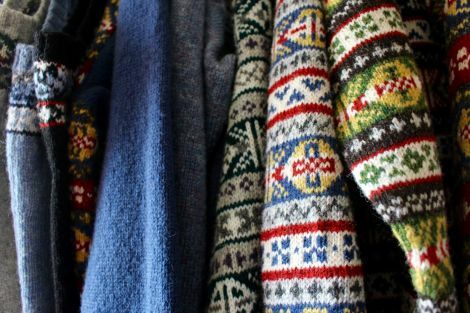 A Fair Isle knitwear collective based in Hollie’s home, which produced about 300 hats and 50 jumpers last year, saw around half of its sales come from bird observatory guests. “In the summer there’s always people wandering up and down the road that we don’t know, and it’s going to be weird only having a few people,” she adds. The fire was first spotted by the crew of the Good Shepherd, with the boat turning back shortly after departing the nearby harbour. Former skipper Neil Thomson, who was on board, is happy to show photos of the surprisingly well established fire taken on a mobile phone on the ship. “There was nothing you could do,” the 67-year-old says at the Tingwall Airport waiting room, shortly after strumming away on a ukulele provided by staff. “You felt that helpless. It’s fair to say no-one in the island’s volunteer fire crew expected they would end up battling a huge blaze like they did one month ago when they signed on – especially Chloe Faita. The French native, who hails from Grenoble, arrived in Fair Isle around two years ago on “some sort of a gap year” to work as a seasonal volunteer at the bird observatory, and as is often the way, she never left. In April last year she joined the fire service ranks – by coincidence alongside fellow French woman Marie Bruhat – and she will have no doubt expected a quieter introduction to island life. “I was a biology teacher, and coming here I had to learn new things to make a living,” she says while perched on a seat inside the cosy Fair Isle museum, knitting needles in hand. It’s not summer season yet, but the stone-built museum – the former school – is open especially for two tourists from Asia, while two visitors from Germany are also on the island on a day trip from Shetland. “So like knitting, I couldn’t even knit before,” Chloe explains, but you wouldn’t have known. 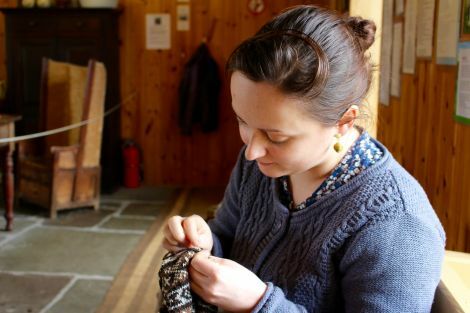 “Most of us just do many things like crofting, knitting, coastguard, fire, various crafts. From Fair Isle newbie to the old guard, and Jimmy Stout lives just down the hill from the museum. The view from his kitchen, gazing out onto the vast sea southwards, grand lighthouse peering into view, is striking. Born in Fair Isle before returning to settle with his wife some 50 years ago, Jimmy is well aware of the effect the bird observatory fire. The facility provided three-star accommodation, as well as a bar, cooked food and a visitor centre, and spare beds at the island’s B&Bs and guesthouses, especially this year, will be at a premium. “It’s very important for the island,” Jimmy says. “It’s been here for 70 years now, and it was important even then, in my father’s time. A big fan of watching sports, he spent the night before in front of the telly watching Liverpool beat Porto thanks to his Sky satellite dish, beaming up to the heavens above from an island in the middle of the sea. Electricity has been guaranteed 24 hours a day since a new turbine, solar and battery scheme was launched last year, replacing the wind and diesel set-up which tended to switch off overnight. Many houses already had their own inverters, though, using battery power to enable the basics to run overnight. “We have 24-hour electricity now, which I think in this day and age, you’re meant to have,” Jimmy says. Like Jimmy, Hollie and Deryk also had an inverter, but the novelty of round-the-clock power is still there for the couple. “Things like in the winter, when you get up in the morning and make a cup of tea, the actual button on the cooker works rather than having to light it with a match,” she smiles. Back up the hill and Eve Eunson, not far from the south end’s imposing cliff face, is on her laptop, presumably struggling with the isle’s sloth-like broadband speeds. Described as “hellish” by Jimmy, some residents’ speeds max out at 0.5Mbps – unless you’re one of the lucky ones graced with satellite broadband. Eve helped to set up an online crowdfunder for the Parnabys after the fire, raising over £26,000 in just a matter of days from people across the world. 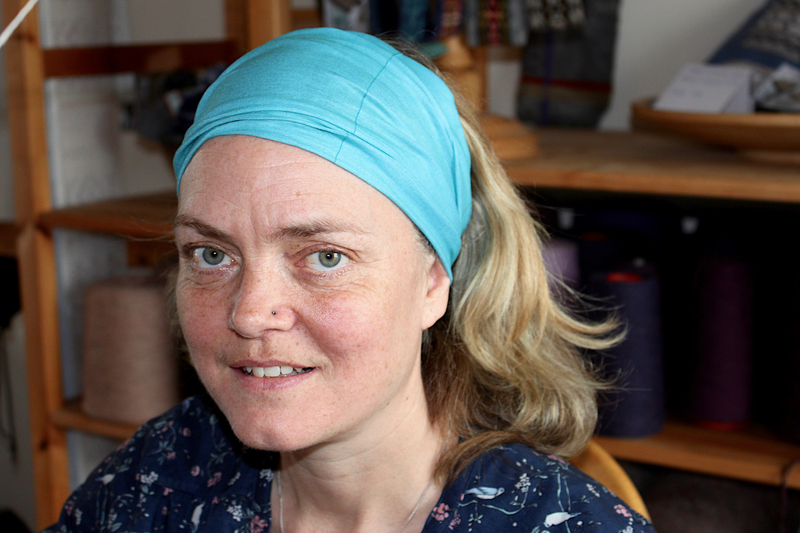 Eve grew up in Fair Isle before moving back a year ago to cover a catering contract feeding workers installing the new electricity scheme, and she has also launched a research project on traditional chairs made on the island. “When I messaged my mum to say the bird obs was on fire, it was one line that she said: ‘the bird observatory made my life’. “She came here as a cook, then met my dad, they had a whirlwind romance and she settled here,” Eve continues. The school has a roll of three at the moment and provides vital employment, and across the road is the fire station, new appliance proudly jutting out the door, with both not too far from the kirk and Methodist chapel. Owned by the National Trust for Scotland, which last year advertised a house for rent on the island for just £23 a month, you get the feeling Fair Isle is self-reliant, and self-policing. But what will the future hold for Fair Isle? Jimmy is hopeful, but, sitting in the study of the house he’s lived in since the 1960s, he acknowledges there is a different way of life on Fair Isle these days. It is clear, in his mind, that Fair Isle’s roots and heritage should not be forgotten – even in an age of 24-hour electricity and satellite television. “You have to have indigenous people living in these places, otherwise it tends to become a different place,” he says. “People come to the place because of the way they see it.